Source Optimized DNA sequence encodingMouse Glial Derived Neurotrophic Factor mature chain was expressed in Escherichia Coli. Molecular weight NativeMouse GDNF isgenerated by the proteolytic removal of the signal peptide and propeptide, the molecule has a calculated molecular mass of approximately15 kDa. Recombinant mouse GDNF is a disulfide-linked homodimeric protein consisting of two amino acid residue subunits,and migrates as an approximately30 kDa protein under non-reducingconditions and askDa under reducing conditions in SDS-PAGE. Presentation Recombinant mouse GDNF was lyophilized from a.2 μm filtered PBS solution. The SCG SC development assay is free of GDNF. 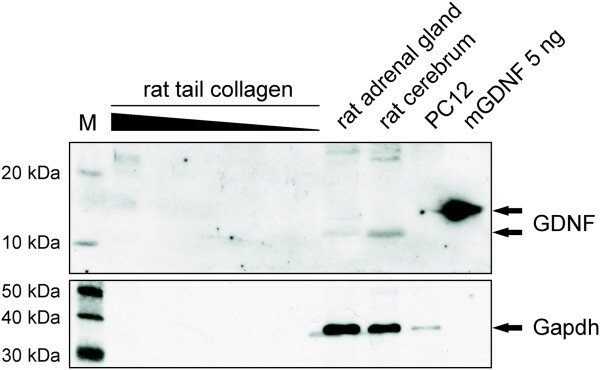 Western Blot for GDNF with different dilutions of rat-tail collagen (20μl, 10μl, 5μl, 2.5μl, 1.25μl and 0.6125μl collagen) were analyzed using anti-GDNF antibody specific for human and rat GDNF. Alterations of gene expression of neurotrophins in the DRG after HSV-1 infection. 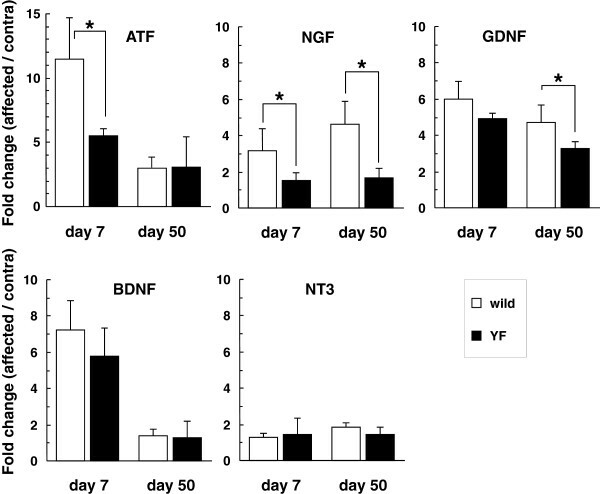 Gene expression levels of ATF3 and neurotrophins (NGF, GDNF, BDNF, and NT3) were normalized to the GAPDH level, and are presented as the fold change in the ratio of the affected side to the contralateral one. For generation of more ventral CNS neurons, including mDANs, medium'>smNPC expansion medium was changed 2 days after splitting to N2B27 medium with 100 ng/mL FGF8 , 1 µM PMA, and 200 µM AA. After 8 days in this medium, maturation medium–N2B27 with 10 ng/mL BDNF , 10 ng/mL GDNF , 1 ng/mL TGF-b3 , 200 µM AA, and 500 µM dbcAMP–was used for the maturation of neurons. 0.5 µM PMA was added to this medium for 2 more days. One day after changing to maturation medium, the cultures were split at a 1∶3 ratio as small clumps, or single cells after Accutase treatment, or earlier when cultures became over-confluent. Cultures were analyzed after 2 weeks in maturation conditions unless otherwise indicated.